Description: Paris, Lehuby 6th edition 1834 Engraved plates (4 incl. engraved titlepage). . Duodecimo tan speckled roan spine extra gilt with two spine labels (spine with 5mm leather loss to head & foot, 1" cracking to head/foot at hinges) half title present +frontispiece +engraved pictorial titlepage +printed titlepage +v-xivpp +316pp. Some foxing and marks throughout. 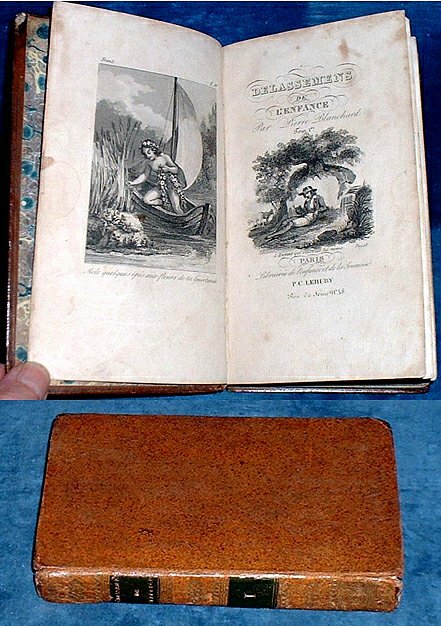 *Short pieces on travel, food products (tea, sugar, coffee etc) moral stories, Jean de la Fontaine, shipwreck + fable with illustration (the child, the birds and the bear) (see Gumuchian 744 for 1st edition).